(Leah Hogsten | The Salt Lake Tribune) Salt Lake valley faith and community leaders joined Mayor Jackie Biskupski, center, Jan. 31, 2019 at the State Office Building demanding full Medicaid expansion, as approved by voters, not the Legislature's push for a different plan, namely SB96 sponsored by Sen. Allen Christensen, R-North Ogden. The replacement proposal is functionally similar to the partial Medicaid expansion plan approved by lawmakers last year, which was superseded by the public vote on Proposition 3. In addition to a more narrow pool of eligibility compared to full expansion, Christensen's bill would impose work requirements on beneficiaries, and would establish an enrollment cap to protect the state against runaway health-care costs. A bill replacing Utah’s voter-approved Medicaid expansion initiative with a more restrictive program was put on temporary hold Thursday, but Republican Senate leaders expect the bill to be on its way to the House on Friday and to the governor next week. Asked about the rapid pace for a significant piece of legislation — the 2019 session began Monday — Senate President Stuart Adams, R-Layton, said swift passage allows the state to begin applying for waivers from the federal government, with the ultimate goal of enrolling new Medicaid beneficiaries on April 1. Under the voter-approved Proposition 3, the federal government would pay 90 percent of the costs for about 150,000 low-income Utahns — earning up to 138 percent of the federal poverty level — to participate in Medicaid. But under the Senate’s replacement plan, SB96, the federal government would initially pay only 70 percent of the costs for about 90,000 Utahns — earning up to 100 percent of poverty level — with the expectation of eventually paying 90 percent of the costs for that smaller population if a waiver is granted. The remaining Medicaid expansion population earning up to 138 percent of poverty would be directed back to the Affordable Care Act’s individual marketplace, where they’d qualify for subsidized insurance and would face some out-of-pocket health care expenses. The bill, sponsored by North Ogden Republican Sen. Allen Christensen, was circled Thursday ahead of a final Senate debate after earning a preliminary 22-7 vote Wednesday mostly along partisan lines, with one Republican joining Democrats in opposition. Hartley agreed with Adams that the sooner a bill is passed, the sooner Utah can begin the application process for any necessary federal waivers. But adjustments and amendments may need to be made to improve the bill, he said, which slows the process down. “Getting the bill right is the most important part,” he said. Utah had been waiting months without action by the federal government on the state’s previous request for a waiver on an earlier, smaller Medicaid expansion program. A two-thirds majority in each chamber — in addition to the governor’s signature — is required to immediately enact a piece of legislation. SB96 achieved that number in the Senate’s initial vote, but Hartley said the membership of the House has not yet been polled on the bill. Paul Edwards, spokesperson for Gov. Gary Herbert said Thursday that it would be premature to discuss the governor signing legislation that has not yet passed. Edwards said the debate over SB96 is arriving early in the session, but the topic is one that both the governor and Legislature are familiar with. Supporters of the initiative have described SB96 as a repeal, in that it provides Medicaid coverage to only a portion of the low-income population intended to be served through Prop 3. On Thursday, a coalition of faith and community leaders sent a letter to legislative leaders urging their support for the initiative — which received 53 percent of a statewide vote in November — and opposition to SB96. The coalition notably lacked the participation of The Church of Jesus Christ of Latter-day Saints, Utah’s predominant faith. A spokesman for the church declined to comment, adding that the faith is selective in its engagement with bills under consideration by lawmakers. 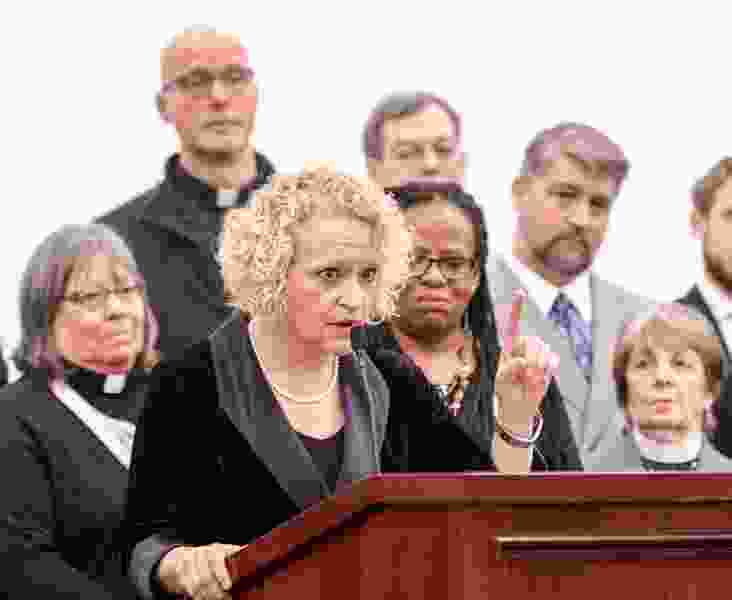 Salt Lake City Mayor Jackie Biskupski said Thursday that the people of Utah, many of whom are led by faith-based principles, voted to fully expand Medicaid and provide care for the needy in their communities.